We have a visitor today! Everyone, I’d like you to meet Fin. If you haven’t met him yet, he’s a super-hot, sweet yet fierce … um … don’t call him a fish! He’s a mer-man. Yes, you read that right. You can thank Author Brenda Pandos for bringing Fin into the world of her Mer Tales series. 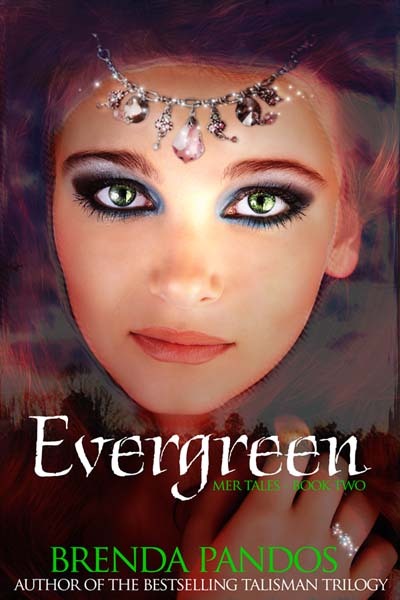 I’m so excited to have Fin here today, revealing the fabulous new cover for Evergreen, the next book in the Mer Tales series, and also to talk to us about food. Since he’s here on a Friday, I couldn’t pass up the chance. After all, how often do you get to ask a mer what they like to eat? So, well, let’s start with that. What do mers eat? Are fish friends or food? Hey Kristie. Actually, you should ask Brenda this. She’s got chickens. How could she ever eat chicken now that they are her pets? Quite the question… I’d say for the most part, fish are food. What’s your favorite food in Natatoria (or under the sea)? Fresh Atlantic salmon, hands down. What’s your favorite land food? What’s your least favorite food in Natatoria (or under the sea)? After a while, raw uncooked unspiced cold food can be boring. I miss garlic too. And there’s only so much seaweed you can eat. Fresh fruit is a delicacy. After you experience all the varieties and tastes on land, our food leaves much to be desired. What’s your least favorite land food? I like everything, well, except peas and tomatoes. And I’m not really into shellfish either, like lobster or crab. If you knew what they ate, you wouldn’t want to eat them either. Gross bottom feeders. If you prepared a romantic dinner for Ash, what would you make? Where would you eat it? I take her to Fannette Island and set out a table on the sand with roses and candles. We’d have grilled salmon (of course) with garlic mash potatoes, a green salad, and cheesecake for dessert. Man… you’re making me hungry, Kristie. *ahem* Sorry. Um, thank you, Fin, for stopping by. Now let’s show off your girl with the big reveal! I can’t wait for this book! A king on the fringes of insanity. A family running for their lives. Ash and Fin’s only desire is to be together and dive into their happily ever after, though their conflicting worlds work to pull them apart. Neither is ready to convert to the other’s life: become a human or a mer. Little do they know that somewhere in Natatoria a secret holds the fine fabric of everyone’s lives together. If the truth is discovered, Ash and Fin will no longer have the luxury of waiting. They’ll be forced to choose. But will it be for loyalty or love? Or will someone else make the choice for them if they can’t decide? 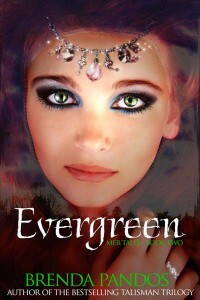 Enter the watery world of treachery, greed, and the binding mer kiss as the story continues with Evergreen, book two of Mer Tales.